of a filmmaker it would freak them out. Staying in touch with every donor is paramount to the art of funding. Get everyone’s email and be sure to create a special mailing list of these names. You want to keep in touch at least every two months with a Rah! Rah! email telling them the progress you have made. 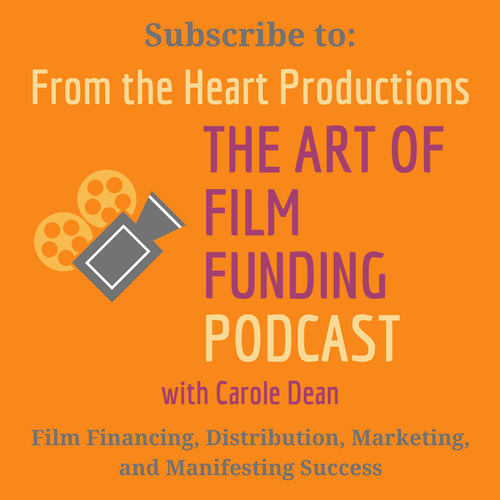 Give them the results of funding parties, grants you applied for, comments from anyone important in the filmmaking industry and let them know what has happened since the last email. short will cost $30,000 or you doc $300,000. They can’t imagine where you will get all that funding. Handle it like you are feeding them an elephant, one bite at a time. If you haven’t already promised to put their names in the credits, do this when you need funds. The amounts you choose are up to you but many filmmakers say $100 is a rolling credit, $500 is three names on a screen and $3,000 gives you a full screen credit. For larger donations you want to talk to them in person. Faun spent time and effort on this party and it paid off with great PR and a net donation of $10,000 for her film, The Tomato Effect. Faun hired an assistant immediately because there is lots of work involved and your assistant’s salary will pay off with donors, potential donors and perhaps a second or third party. My list of 44 things to do for a funding party is really built around this type of party. Creating your website so it will hold lots of logos is important. This is the quid pro quo that you trade for that weekend from Hilton or the organic winery for that free case of last year’s award winner. The donor’s logos will be on your first page so you want to hold logos on both sides to maximize the number of donors. 1. You need to plan a date at least 60 to 75 days in advance. 2. Hire an assistant for $10 an hour plus a bonus based on how much you bring in, perhaps 10% of the income as their bonus; they will earn it, believe me. – they love to work with filmmakers. 4. Your website has to have your film’s pitch and the first two paragraphs must fully explain the story of your film. Make them dynamite. 5. Design the site for logos on the left and right sides to accommodate lots of ads. 6. Your site has to give the meaning of the film quickly and succinctly. 7. You need a place for people to send donations with an address for mailing and Pay Pal for impulse money. People who surf the web don’t want to call you, they want to click on buttons to send you money, so make this possible. 9. Start with your search for a local “star.” Someone whose name is well known. 10. Set your date for the event based on their calendar so it is locked in. 11. Create personal invitation letters to other people who would know your “star” with an outline and pictures of your film. Follow up with phone calls to their offices. 13. Find a caterer who will give you a major discount using your website as your repayment for their reduction in price. Let them know you will feature them boldly on your website as “catered by” and you will put them in your program and give them credit on the film and mention them in any PR opportunities. This will work! 14. Give a down payment on your Visa card to seal the deal. 15. Look for more people of the same ilk as your known guest. For example, if this is the mayor’s wife, like Faun had for her party, read the papers for socialites and contact them with your package and a personal letter inviting them to the party stating the mayor’s wife is coming. 16.If this is an athlete, use the same practice: find any other athlete in the city who may be less known. Remember, athletes follow athletes, politicians follow politicians, etc. Now you are 100 times more likely to get any of these people to come to your event because you have a name they want to meet. Send them your proposal; call back with a personal invitation. 17. Faun charged $75 and she said she would never charge an entrance fee again because she made most of her money on the silent auction so your job is to get them there. you worked for ten years ago who is now the manager. 19. You need a great invitation. You might want to use a photo that represents your film. This way you have branded your film and people can see your vision. Using postcards with an invitation on one side can work. 20.Creating an invitation just for this event is another way. 21. You need to send out four times the amount of invitations to get your core amount. If you want 100 people, send out 400 invitations and you can expect to get about 150 or so RSVPs and you may have 100 people show up (these are Hollywood statistics). 22.At the same time you want to find donors who will give you things you can auction off. Faun said that people sometimes ran the auction up to the full price because they wanted to get something for their donation. 24. Call hotels for rooms on the weekend when they are slow. You want to auction off two nights at the Hyatt or one night at the Hilton. 25.Each hotel has a PR person just for this reason, to give rooms away when you have something in return to offer them. 26.What’s that? Demographics, demographics, demographics! My film audience, my party audience fits your demographics. 27. You have to do your demographics and know what your film fits; age 18 to 38 and median income of $80,000 is a good one. Hyatt and Hilton both want that group of people. tell them what you want. You pitch them the two minute short pitch that has everything in it. 30.It has to be an open-ended gift to be used in whatever time limit they give you. 31. Go after yoga lessons. 32.Wine by the case or six bottles at least. 33.Tango lessons.Who takes them? No one, but it sounds so romantic. 35.Potted plants from a nursery. 36.Three hours in a limo, what woman would not like that? 37. A free tour of the opera house, etc. Be creative. they will be part of the funding for the film. 39. They will get a DVD of the finished film and be on your website as a donor. 40.Now you have a room and food, go after some free booze. That should be easy. Many liquor companies want to be in films or around film people. 41. What about entertainment? You are in the entertainment industry so who do you know that might be able to perform for 10 to 15 minutes for you? You might want some Latin dancers or some interesting musicians to play while people talk. 42.As the time draws closer, call your main person and tell them how things are progressing. Let them know that you have all these wonderful donors for silent auctions so people will go home with certificates for donating to your film, and “ask” them if they have any friends that you could invite? This is a big ASK. They should give you a few. 43. Send them packages first then call them and say “the mayor’s wife suggested I invite you to this event as she/he is coming.” Pitch it succinctly and focus on how much you need their support to make this film. When they say, “Okay”, ask them if they can give you the name of any of their friends that might enjoy a great event like this because “Yolanda” is dancing or the local TV star is the host and it should be a fun evening. coming and ask them for more names.